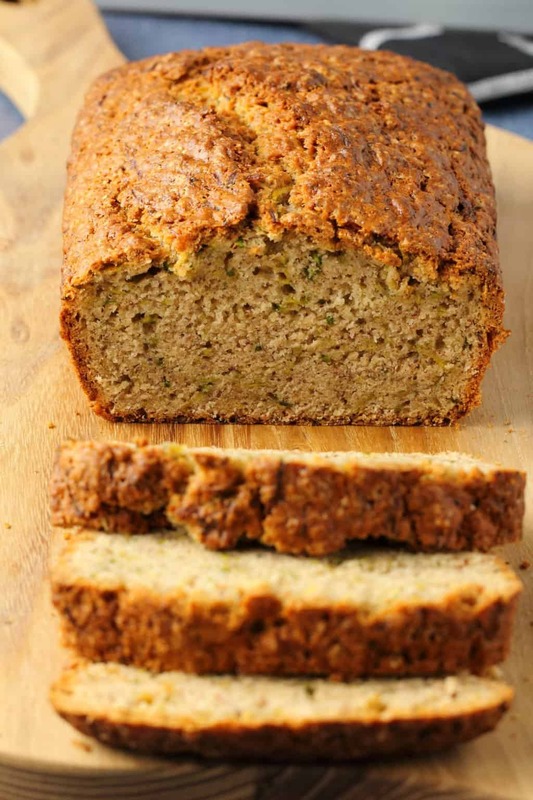 Wholesome and delicious vegan zucchini bread. 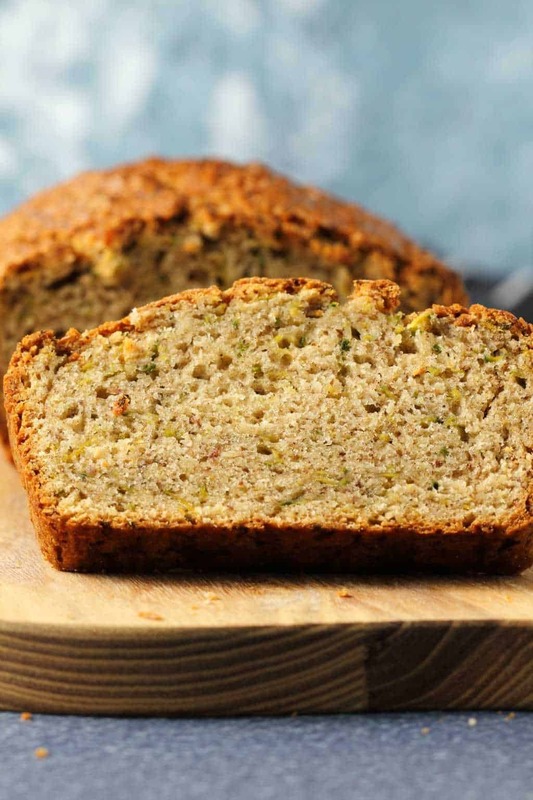 Fluffy and perfectly moist you’ll never suspect this delicious bread is hiding green vegetables! 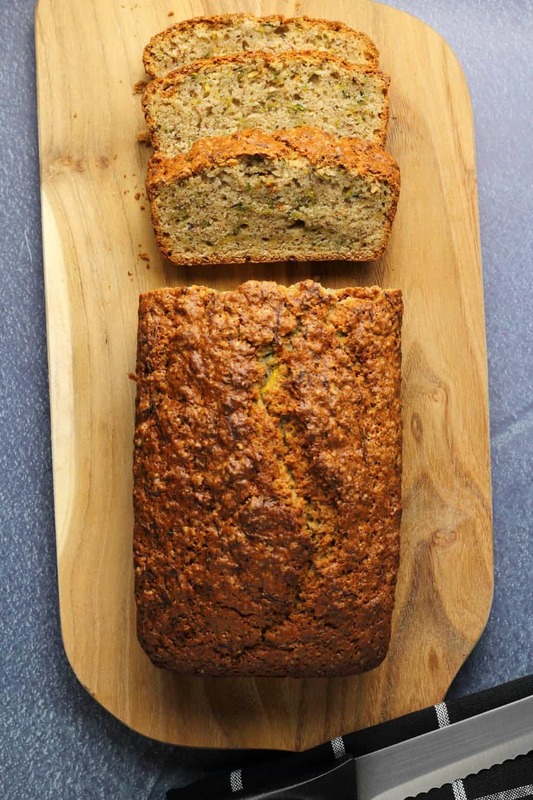 This vegan zucchini bread is the latest in the zucchini craze I’ve been on. 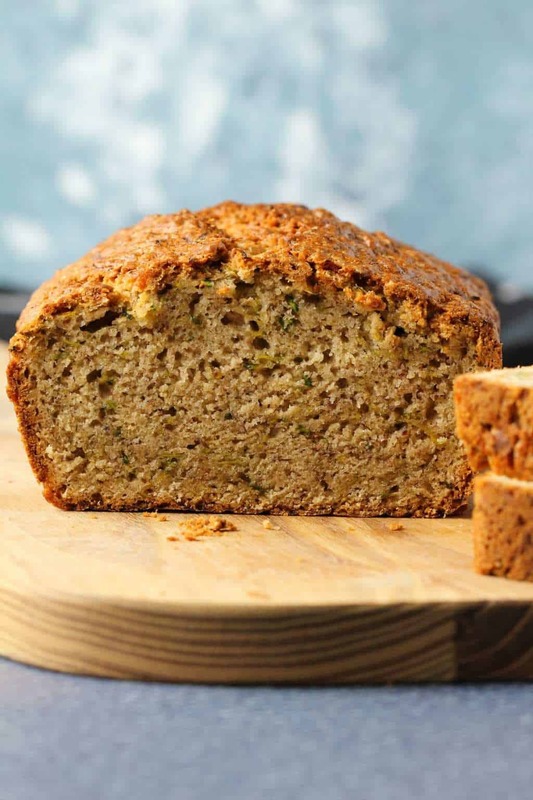 And this craze has already resulted in vegan chocolate zucchini cake and vegan zucchini muffins, and now we have zucchini bread. What’s next? I dunno, but I’m very open to suggestions! 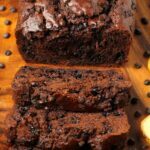 Update: boy do we have some more vegan zucchini recipes for you, vegan zucchini brownies and vegan zucchini fritters are here! 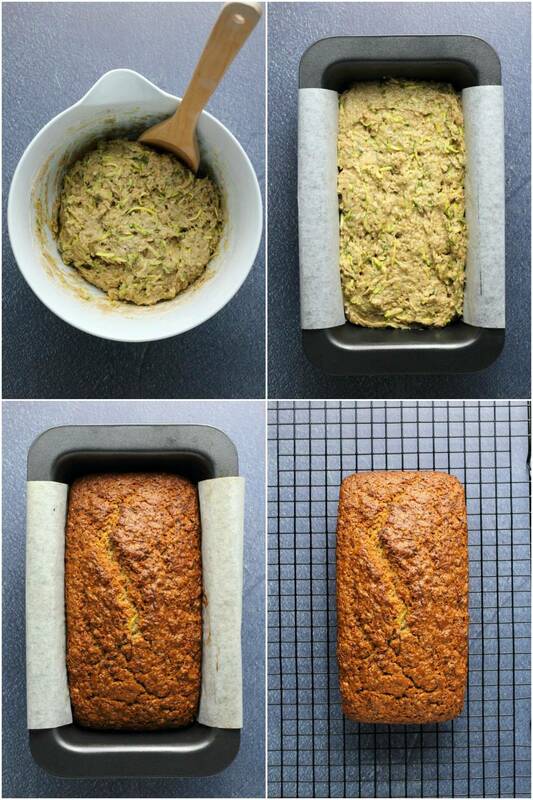 Basically, zucchini in baked goods is a fabulous idea. 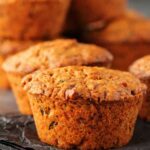 It’s almost undetectable in the final baked result, but it adds heaps of moisture and you get a couple of servings of veggies from your baked goods! This is very much a win/win situation. As you can see from the pics above, the zucchini bread batter isn’t the most beautiful looking thing on the planet. But once it’s baked into bread, suddenly it’s gorgeous! So don’t be put off by the look of the batter. The batter is also very, very thick. In fact you will likely think I’ve left something important out of the recipe, like a lot of extra liquid! But don’t worry, it does come together. Add everything into the bowl and mix it up, it will look like it will never come together, there will be way too much dry stuff for the amount of liquid. Leave the bowl for a couple of minutes while you prepare your loaf pan with some non-stick spray and parchment paper and then come back to it and mix again and suddenly it works. What happens is the zucchini releases extra moisture while sitting and suddenly it all works. If you add extra liquid (beyond what the recipe calls for) you could definitely end up with a stodgy bread, so just be a little patient with it and it will all come together so you have a batter that looks like what you see in the picture above. Something to keep in mind is not to overmix the batter. This is why you want to do a quick mix, and then just leave the bowl for a couple of minutes and then come back and mix again. You have to be careful not to overmix, because this can cause your bread to not rise properly. 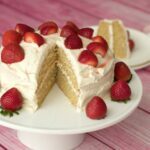 But all this aside, this is a really easy recipe that works wonderfully well when followed correctly, so don’t be daunted by odd looking batter or worries about overmixing. 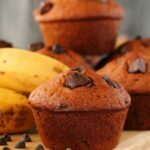 I used a small mashed banana in this recipe, which gives it just a touch of banana bread flavor! 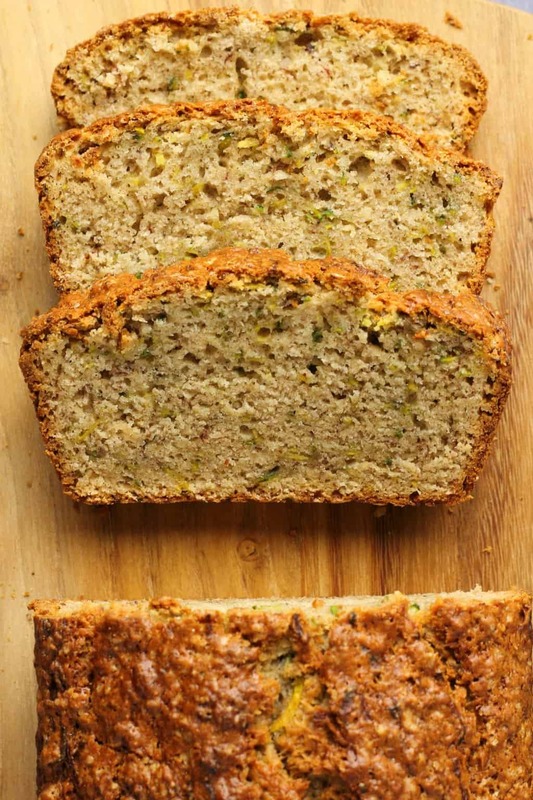 Which is divine because who doesn’t love banana bread? 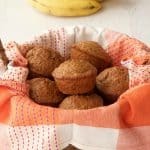 But it’s just a touch, a hint, and it combines beautifully with the cinnamon, nutmeg and brown sugar in this recipe. Yes, you can see little flecks of green zucchini in there and it’s super pretty, but don’t worry, it does not taste anything like green vegetables! 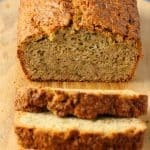 It is just like a delicious dessert bread, kinda like banana bread, but also not. Store the bread covered at room temperature where it will keep for up to 5 days. 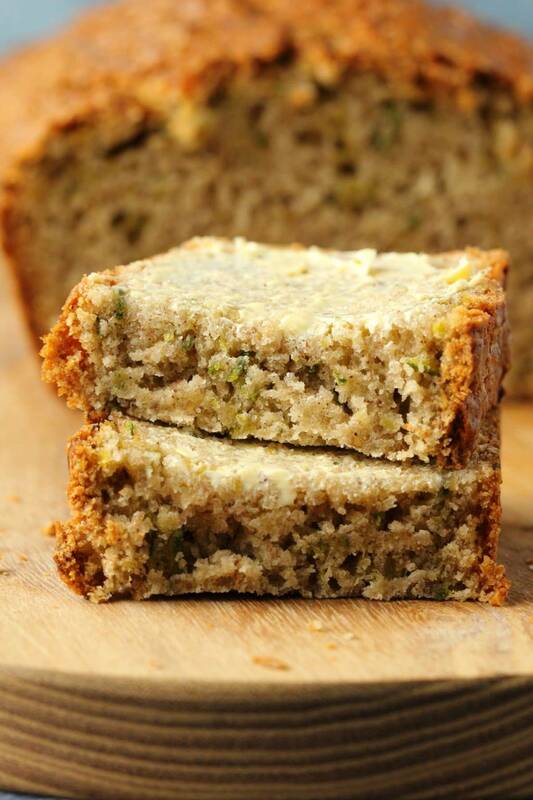 So what do you think of this vegan zucchini bread? Going to try it soon? Let us know in the comments. 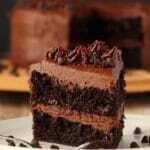 And please do rate the recipe too as that is a huge help! Thank you! Sign up to our email list while you’re here, you’ll get an awesome 10-recipe ebook containing vegan dinner recipes and you’ll be the first to know when new recipes are posted to the blog. Sift the flour into a mixing bowl and add the white sugar, brown sugar, baking powder, cinnamon, nutmeg and salt. Mix together. Prepare your flax egg by mixing 1 Tbsp Ground Flaxseed Meal with 3 Tbsp Hot Water and allow to sit for a minute to become gloopy. Add the shredded zucchini, mashed banana, soy milk, melted coconut oil, vanilla and flax egg to the mixing bowl and mix in briefly. It will seem like there is not enough wet ingredients to mix in properly, don’t worry. Leave the mixing bowl for a couple of minutes and prepare your baking dish. Spray a 9×5 loaf pan with non-stick spray and then line it with parchment paper so that the parchment paper hangs over the sides, so that when the bread is baked, you can easily lift it out of the loaf pan using the parchment paper. Return to your mixing bowl and mix in again. The zucchini will have released more water into the mix and you should be able to form it into a thick batter. Mix it in properly, but don’t overmix. Transfer to the parchment lined loaf pan and smooth down evenly. Lift the bread out of the loaf pan using the parchment paper and place onto a wire cooling rack to cool before slicing. *You can use another non-dairy milk like almond milk if you prefer. *I usually shred my zucchini in the food processor (you shred it with the skins on, no need to peel it first) as it’s the easiest way to do it. 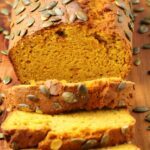 I wonder if this bread works also with almond or coconut flour, because of the gluten content here for this recipe ? What do you think? 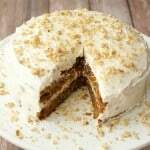 Very good recipe, nice golden colour crust, I am eating it for breakfast with peanut butter. Thanks for sharing. Awesome Stewart! So glad to hear that you’re enjoying it, peanut butter must be divine with this, will have to try that! 🙂 Thanks so much for posting! 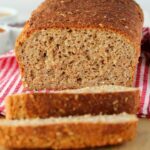 The bread looks great but i don’t use banana’s – is there something else i can add instead? I wonder if grated apple would do??? Hmmm, maybe some applesauce? Like 1/4 cup. Haven’t tried it but I think that should work out as a swap. I have not tried this recipe yet but I am planning on doing so. I am interested in a zucchini patties. Do you happen to have a vegan version of zucchini and carrot patties? very good recipe 😋 texture and just the right amount of sweetness. 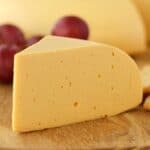 Instead of Soy Milk, can I use water? Or had I better use some non-diary milk? Hi Elsie, water might be okay, and it’s a small amount anyway, but preferably any non-dairy milk since it was not tested with water. All the best!